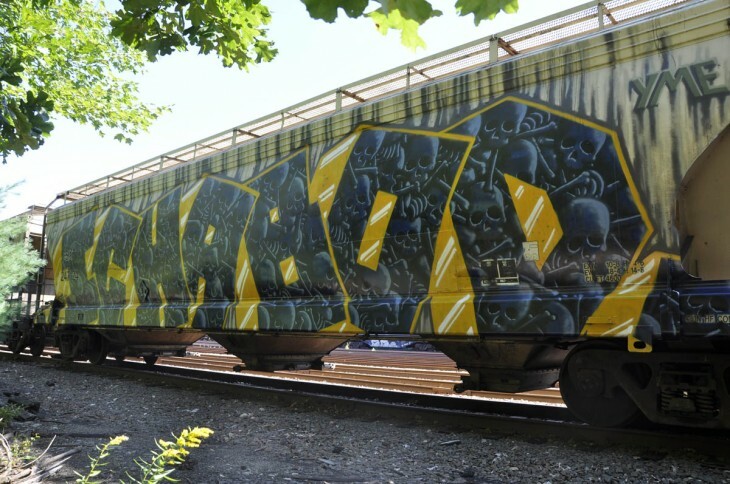 ICHABOD is a master of American freight train graffiti: prolific, durable, and consistent. 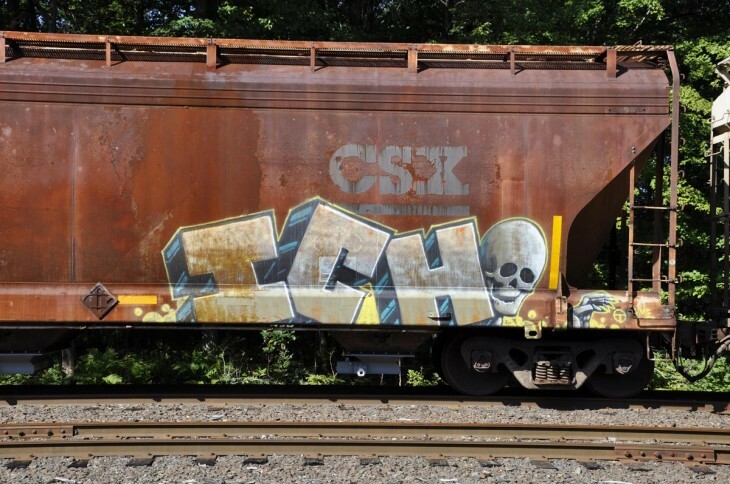 In a game where thousands of graffiti writers compete to make their names as densely distributed as possible throughout the nearly two million freight cars across North America, ICH has been among the very best and most successful. Ceaselessly repeating his ultra-legible signature piece, he makes two things as likely as can be in graffiti: that his name will be rolling on every train in North America, and that you, me, and anyone else will be able to read it. Those sentiments and experiences are hardly unique to ICHABOD: they encapsulate much of the essential appeal of painting freight trains, an activity with thousands of practitioners across the continent. And like the top tier of practitioners of freight train graffiti, ICH researched the United States rail system with the passion of the most serious railfan: he learned which types of cars are most likely to travel the most widely, and which will only run back and forth on a defined route. He learned which types of cars look best when painted, and based on the customers they served, where he might find them laid up on nights and weekends. And he learned how to sustain his painting spots by secrecy, strategy, and the rigorous discouragement of uninvited graffiti writers. While ICHABOD’s friends certainly admired the effort and dedication he put in, more than a few were wondering about him. He wasn’t a socially fluid guy, even among graffiti writers, didn’t work a job like every other schmuck, and lived on hardly any money. He had begun to write graffiti not as a teenager, but at the ripe old age of 27, and took it on with the same intensity which he had previously attacked his other niche interests like chemical classification systems and certain popular strategy-based board games. Doing the same piece forever was just one part of it: while socially awkward and brilliant-but-terrible-at-school, can’t-seem-to-work-a-regular-job, living-on-no-money artists and graffiti writers are nothing new, there was something different about ICHABOD as a person. His friends knew it, and he knew it, too. He began to research the features of Asperger’s, and saw himself again and again in the descriptions. And he found one key facet that made his experience in school and as an adult trying to sustain employment, so difficult. “The thing with Asperger’s is the type of functional ability called executive function,” he says. “In the brain, it’s sort of the ‘get up and go.’ I can overthink anything into the ground for hours. I can even come up with a good plan, and even come up with a list of sub-goals, but to get up out of the chair and perform sub-goal number one is where I fall apart, and that’s where a lot of Aspies [term used among people with Asperger’s] fall apart.” Indeed, most people who don’t have Asperger’s wouldn’t really even ever think of things in terms of goals and ‘sub-goals,’ they’d just do them, in the same way most of us can plod along through a job, a small-talk conversation, a homework assignment, or a host of other tasks that ultimately point us in the general direction of a secure future. And what we non-Asperger’s individuals are fortunate to have, ICH describes, is “the discipline to just muddle through.” He continues: “That’s something I lack. I have no interest in muddling; I will simply abandon something that does not serve my purposes. And that’s why I’ve struggled to stay employed my whole life, because I’ve never found a job that had anything to do with my interests – and of course my interests aren’t the kind that pay well, even if you’re good at them.” Those interests were another key trait of Asperger’s – deep, sustained, years-long fascinations with very narrow, sometimes impractical topics. Someone with Asperger’s might have all of the specifications of every camera lens memorized, yet not be interested in the least in photography, or learn the molecular structure of every chemical, with no interest in chemistry as a whole. And when faced with a small-talk situation, they may abruptly steer that conversation into a monologue on one of their narrow interests. But what’s gotten ICHABOD to work, regrettably, hasn’t transferred over into a way to sustain himself. “Everybody has their hobbies and passions and what gets them out of bed in the morning,” he admits, “and it seems to me to be a great coincidental thing that none of the things that have sparked my interest have a parallel lucrative field.” And while those interests might run quite deeply, they can be a bit of a prison. Stepping outside of them is extremely difficult. Coupled with that inability to ‘muddle through,’ Asperger’s has made many of the visible yardsticks of personal value – success in education, steady and gainful employment, social ease – a tremendous struggle. Charges of being stupid, lazy, and weird follow all too easily. But in those descriptions of the features of Asperger’s came some revelations not only about what had made functioning in his day-to-day life so unusually difficult, but what made him so very, astonishingly good at freight train graffiti. It wasn’t just that learning the ins and outs of the North American rail system had become one of his interests, such that he had no problem applying his capacious ability for research into an area with direct benefit. There was also a peculiar physical component to it. Not only did freight train graffiti click for ICHABOD, there was also something about the ceaseless repetition of what is essentially the same piece. “I never get tired of it,” he says, even though he has painted upwards of 3,000 of them, sometimes five or ten in a day. “I have yet to get tired of it.” While the colors and the freight cars change, it’s fundamentally the same image again and again. 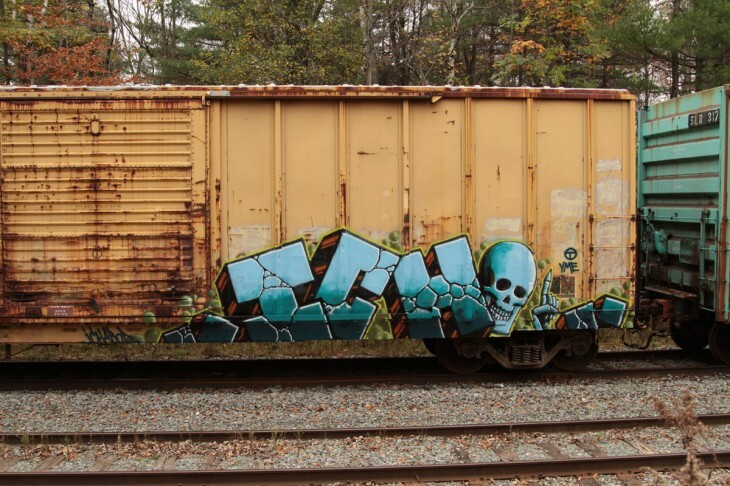 It’s a combination of plainly readable text and a memorable mascot skull character that has made him – it’s hard to think of a more fitting candidate – the freight train graffiti writer most recognized by the general public in North America. 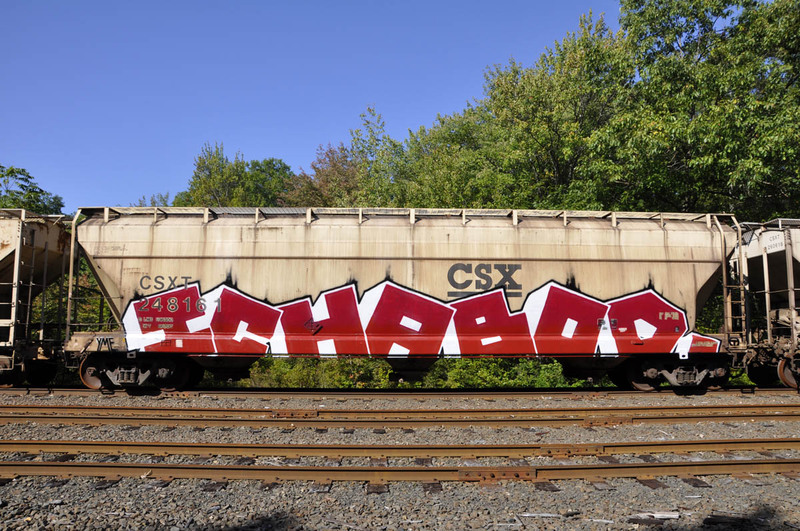 That approach, driven in part by a desire to get the maximum impact from each can of paint he uses – the maximum ‘play,’ as he calls it – has worked well for ICHABOD. In a train yard with fifty cars in it, he’ll paint the five that he knows will circulate most widely, a strategy he’s borne out by extensively tracking certain types of freight cars through the system, using their alphanumeric codes, just like the freight companies do. And while by now he’s painted alongside many of graffiti’s greats, he’s just as likely to be out by himself.